Electronic and photonic materials discussed in this handbook are the key elements of continued scientific and technological advances in the 21st century. 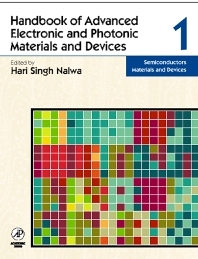 The electronic and photonic materials comprising this handbook include semiconductors, superconductors, ferroelectrics, liquid crystals, conducting polymers, organic and superconductors, conductors, nonlinear optical and optoelectronic materials, electrochromic materials, laser materials, photoconductors, photovoltaic and electroluminescent materials, dielectric materials, nanostructured materials, supramolecular and self-asemblies, silicon and glasses, photosynthetic and respiratory proteins, etc, etc. Some of these materials have already been used and will be the most important components of the semiconductor and photonic industries, computers, internet, information processing and storage, telecommunications, satellite communications, integrated circuits, photocopiers, solar cells, batteries, light-emitting diodes, liquid crystal displays, magneto-optic memories, audio and video systems, recordable compact discs, video cameras, X-ray technology, color imaging, printing, flat-panel displays, optical waveguides, cable televisions, computer chips, molecular-sized transistors and switches, as well as other emerging cutting edge technologies. Electronic and photonic materials are expected to grow to a trillion-dollar industry in the new millennium and will be the most dominating forces in the emerging new technologies in the fields of science and engineering. This handbook is a unique source of the in-depth knowledge of synthesis, processing, fabrication, spectroscopy, physical properties and applications of electronic and photonic materials covering everything for today's and developing future technologies. This handbook consists of over one hundred state-of-the-art review chapters written by more than 200 world leading experts from 25 different countries. With more than 23,000 bibliographic citations and several thousands of figures, tables, photographs, chemical structures and equations, this handbook is an invaluable major reference source for scientists and students working in the field of materials science, solid-state physics, chemistry, electrical and optical engineering, polymer science, device engineering and computational engineering, photophysics, data storage and information technology and technocrats, everyone who is involved in science and engineering of electronic and photonic materials. For libraries in universities and industrial institutions, governments and independent institutes, upper-level undergraduate and graduate students, individual research groups and researchers working in the field of chemistry, solid-state physics, material science, electrical engineering, polymer science, spectroscopy, crystallography, xerography, superconductivity, electronics, photonics, device engineering and computational engineering, photophysics, data storage and information technology and technocrats, everyone who is involved in science and engineering of electronic and photonic materials.